Convert and enjoy audio files in MP3! Do you have audio files that are all in different formats, of different sound quality, recorded at different volume? Wouldn’t it be nice if you could organize them all and convert them to MP3 format on your computer? Wouldn’t it be even nicer if somebody else did it for you? Well, we have the next best thing: Easy MP3 Converter Lite. As easy as 1,2,3! 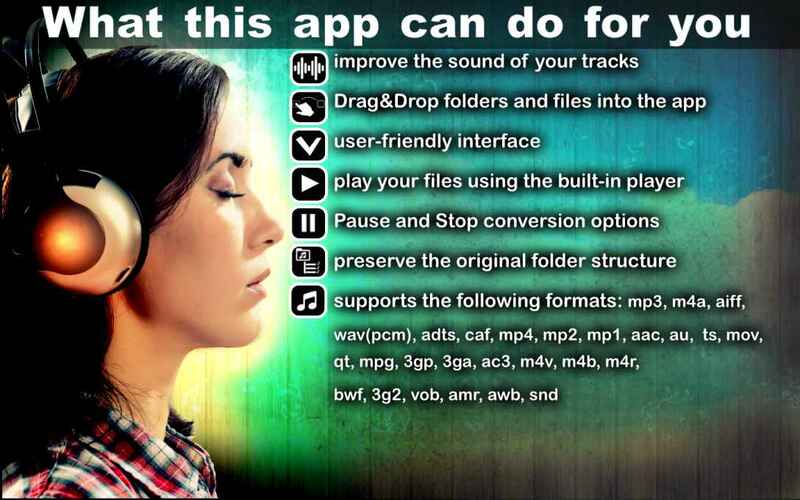 You provide the audio files, and the app will convert them all into MP3 files. Would you like to extract audio from video files? No problem! This app will do that as well. Easy MP3 Converter Lite converts the following formats into MP3: mp3, mp4, wav, aiff, caf, mp2, mp1, aac, au, m4r, ts, mov, qt, mpg, 3gp, ac3, m4v, bwf, 3gt, vob, amr, 3ga, awb, au, snd, adts and m4b . As the name suggests, the conversion process is really easy. Just drop the files you want to convert into the app window. How many files? As many as you want! Yes, really! Would you like to play your files before you convert them? Easy MP3 Converter comes with an embedded player. Just click the Play button next to the file you want to hear. Dropped a wrong file into the app window? Remove it with one click! For customized results, explore the options in Settings. 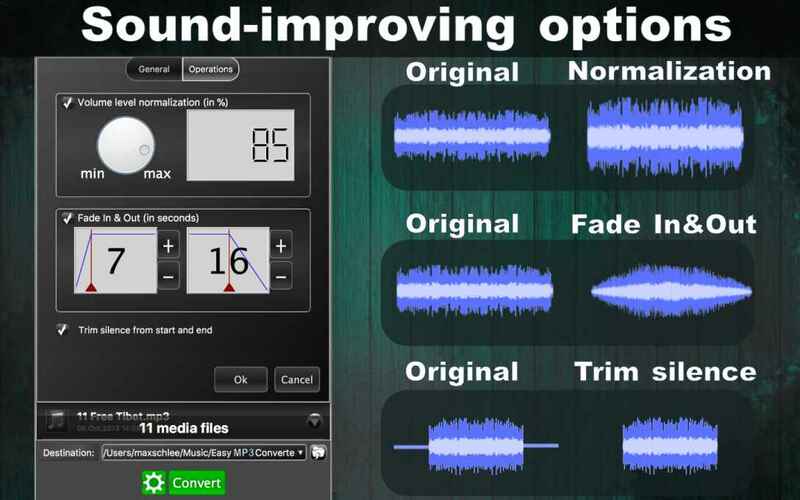 You can customize sound quality, adjust sound channels and bits per sample. Easy MP3 Converter also offers Source and Destinations options as well as After Conversion options. You can also normalize volume, trim silence between tracks and add fade out. All set? 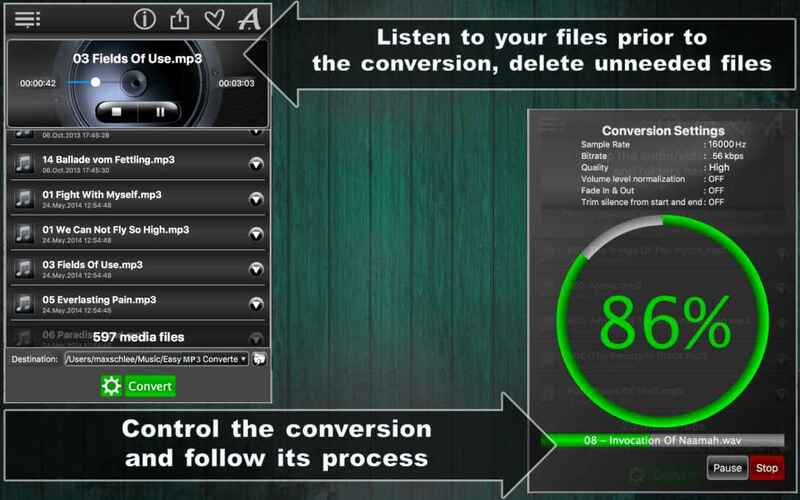 Press Convert and enjoy your audio files in MP3! Yes, it really is that easy! 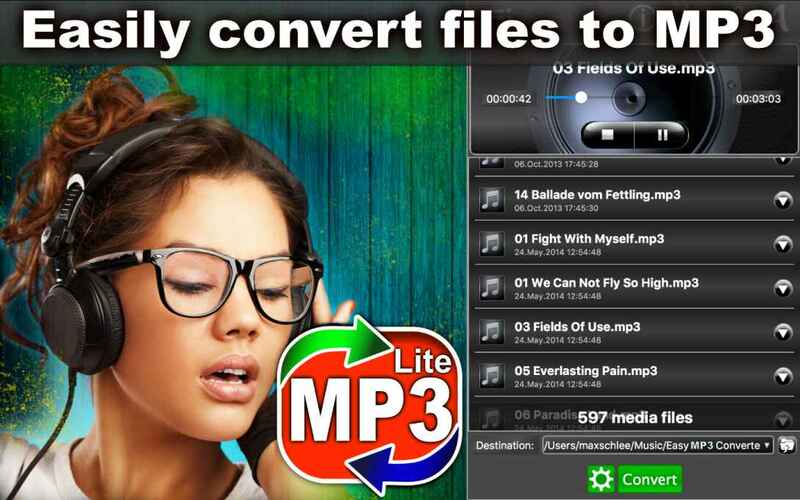 Download Easy MP3 Converter Lite now and experience it for yourself! The full version of Easy MP3 Converter is here.